Different transit services call for different facilities. While street design practice has historically focused on motor vehicle movement and has treated transit capacity as primarily influenced by stop design, street design processes are increasingly recognizing that key transit lines—those with higher ridership, higher frequency, and more potential for growth—both need and justify greater accommodation than lower-ridership routes. Designing for the type and frequency of transit service on a street means providing transit with priority treatments and the space necessary to perform at a high level. 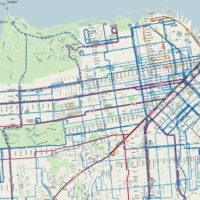 Whether a route uses bus, light rail, or streetcar, service decisions in an urban transit network are made based on a complex combination of capacity, reliability, comfort, and the need to accommodate passengers in a network. Some projects involve a simultaneous change in transit service on a street along with transit prioritization or streetscape investments, but all street design projects have a service context. This section provides designers and planners with a basis of discussion of the needs of transit, by linking specific design elements and comprehensive street designs, found later in the Guide, with concepts of transit service frequency and the type of transit route supported by a street. Robust evidence-based service planning using realistic data can identify new service and growth opportunities, especially opportunities to add rapid routes. These can be supported by street design to create broader transit benefits. Street design has an interactive effect on transit frequency, both supporting transit at different volumes, and attracting passengers to different degrees. References for Introduction: 9 found. Ryus, Paul (PI), Alan Danaher, Mark Walker, Foster Nichols, William Carter, Elizabeth Ellis, and Anthony Bruzzone. "Ch. 6: Bus Transit Capacity." Transit Capacity and Quality of Service Manual, Third Edition, TCRP Report 165, Transportation Research Board, Washington. Litman, Todd. "A New Transit Safety Narrative." Journal of Public Transportation 17(4), National Center for Transit Research, Tampa. Kilcoyne, Ron, et al. "Design of On-street Transit Stops and Access from Surrounding Areas." Sustainable Urban Design Standards Working Group, American Public Transportation Association, Washington. Dan Zhou, Cheng Xu, Dian-Hai Wang, and Sheng Jin. "Estimating Capacity of Bicycle Path on Urban Roads in Hangzhou, China." Zhejiang University, Submitted to the 94th Annual Meeting of the Transportation Research Board, Washington. Christopher B. Leinberger & Patrick Lynch. "Foot Traffic Ahead: Ranking Walkable Urbanism in America’s Largest Metros." George Washington University School of Business, Smart Growth America, Washington, DC. James G. Strathman, Thomas J. Kimpel, and Steve Callas. "Headway Deviation Effects on Bus Passenger Loads: Analysis of Tri-Met’s Archived AVL-APC Data." Transportation Northwest Regional Center 10, University of Washington, Seattle. National Association of Realtors. "2015 Community Preference Survey." Portland State University, National Association of Realtors, Chicago, IL. Regional Transportation District. "Streetcar and Light Rail Streetcar and Light Rail Characteristics." RTD FasTracks, Denver. Oak Ridge National Laboratory. "Chapter 8: Household Vehicles and Characteristics." Transportation Energy Data Book, 34th Edition, US Department of Energy, Washington.